In yet another topsy-turvy, Jail SP clarification stating that Kishorechandra’s advocate left early before completing formalities, Shreeji Bhavsar the Supreme Court lawyer who is fighting the case for Kishorechandra said that he waited for three hours to meet his client and as the Jail SP was not in the office and authority in charge denied to give permission for meeting his client and refuse to confirm when the SP will return. “It’s very satisfying to see that Superintendent of Manipur Central Jail, Sajiwa has very promptly within 24 hours issued a clarification in regard to the news published in several newspapers today that, the Jail authorities didn’t gave me permission for meeting with my client detenue Kishorechandra on 20th December, 2018, at least they have acknowledged. “Although, I totally reject their claim that they were undergoing some formalities and I left early. I stayed at the Jail for almost 3 hours and the officer in charge on duty told me that the Jail Superintendent is not available and his wife can meet him but in case of meeting with the Advocate only the Jail Superintendent can give permission for meeting and I have to wait till he comes and he also cannot confirm me at what time the Jail Superintendent will come, on this, I told him that at first place I am the Advocate for Kishorechandra and his wife Ranjita is also present with me and I have all the right to meet my client in Jail, secondly even if the permission is needed, it has to be given by the Office of the Jail Superintendent and whosoever is in charge in absence of Jail Superintendent can give me permission to meet my client but he didn’t agreed with my request and kept me waiting for almost 3 hours, finally I had to come back without meeting my client Kishorechandra. “If the Jail Authorities are now claiming that they were undergoing some formalities and in between I left, I challenge them to show any document of formality which contains my Name or Signature? For 3 hours the officer in charge didn’t even accepted my Application and said that he cannot accept my Application and I shall give it to the Jail Superintendent only whenever he come and therefore I say that for 3 hours the Jail authorities were not undergoing any formalities but only denying me access to meet my client Kishorechandra on one or other pretext. Lastly, there is at least one thing I can agree with the Respected Jail Superintendent clarification is that, PEN can be used as a weapon they must be aware of the fact that, “the Pen is mightier than the sword?”, Shreeji Bhavsar. Earlier in his clarification the Jail SP, Touthang stated that the Counsel Advocate of Kishorechandra Wangkhem (Journalist) now detained under National Security Act (NSA) at Manipur Central Jail, Sajiwa namely Shreeji Bhavsar came to Manipur Central Jail, Sajiwa on 20/12/2018 but left early while formalities like entry of names, sorting out the prisoners from their sectors, etc were being conducted. The wife of the NSA detenue Shri Kishorechandra Wangkhem and her brother met the detenue after completion of formalities as can be seen in our jail Interview Register. Mrs Ranjita and her brother took the Vakalatnama signed by Mr. Kishorechandra with them. Chief Minister N. Biren Singh today said that there is no question of sacrificing even an inch of land while solving any issue of the state. “There is no sacrifice of land while signing the Memorandum of Understanding with the Nagaland based Angamese bodies over the detention of MMTA trekkers in connection with the Sangai Festival at Dzuko Valley”, the Chief Minister said while replying to a calling attention motion by Congress MLA Md. Nasir. Nasir while moving the call attention motion said that the MoU signed between the Southern Angamese Peoples’ Organization, (SAPO), Southern Angamese Youths’ Organization (SAYO) and Manipur Mountaineering and Trekking Association (MMTA) in the presence of a Minister of the Manipur Government mention that a part of the MoU said that SAPO and SAYO will be the legal custodian of the Dzuko Valley understanding the history of the Valley without mentioning ‘Nagaland part of the Valley’. “The term “legal custodian of Dzuko valley” is nothing but surrendering of the Dzuko Valley to SAYO and SAPO”, Nashir said and added that even the MMTA had clarified that they have not seen the content of the MoU while singing as they are more anxious on saving their trekkers first. Clarifying the Congress MLA, Chief Minister N. Biren Singh said that the MMTA trekkers detained and later brought home, were arrested from the side of the Nagaland area in Dzuko valley after complaint by SAYO and SAPO to the Police Station regarding a wild fire at the valley on the day and naturally when it said Dzuko valley, it means the Dzuko Valley on the part of Nagaland. The Chief Minister further said that the state boundary is clear and is with the Survey of India, however there has been a dispute over village boundary between Tunjoi and the Angami Village on the Nagaland side. The dispute began since 1985 and the government has every records of it. N. Biren Singh added the government of Manipur has been urging the Central government and the Survey of India regarding the matter. The Chief Minister also added that government is taking up all measures to build a Guest House at the foothills of Mount Isso and that it is on record that 1/3rd of the Dzuko Valley belongs to Manipur. North-East Forum for International Solidarity (NEFIS) while terming the sentencing of Manipur journalist, Kishorechandra Wangkhem to 12-month custody as unfortunate demands the Supreme Court to take up the matter as an urgent Suo Moto case in order to restore the fundamental rights of the journalist. It should be noted that Wangkhem was arrested on November 27 on charges of sedition under the National Security Act (NSA) and sent to jail. Earlier he was granted bail in the case by a CJM court in Imphal (West), which had maintained that the remarks were an “expression of opinion against the Prime Minister of India and Chief Minister of Manipur” and couldn’t be termed as seditious. On December, the approval board of NSA constituted in the case sentenced the journalist to 12-month custody. While not supporting the indecent language used by the journalist, NEFIS unequivocally stands by his right to freedom of expression. NEFIS considers this as a blatant attack on people’s rights and a clear sign of the use of dictatorial powers by the BJP governments in the state and at the centre. The approval board’s order to sentence Wangkhem to 12-month custody which reportedly said ‘after considering the proximate past activities of the [detainee] and potential danger of his activities which are prejudicial to the security of the state and maintenance of public order and there is apprehension of his continuing to act in [similarly] prejudicial activities, the moment he is released from detention, is further of the opinion that the said person should be detained for the maximum period of 12 months as provided under Section 13 of the said Act’, is unfortunate. It is very important at this juncture to preserve freedom of expression and right to dissent of the people. NEFIS believes that if the trend continues, no semblance of democracy would be left in the country. Moreover, it is time to repeal the undemocratic NSA Act which is used to curb and repress the voices of the opposition parties/forces. According to the 177th Law Commission Report of 2001 figures for persons arrested under preventive provisions in India including NSA- stands at a whopping 14,57,779 excluding the state of Jammu and Kashmir. State government has suspended 5 police commando personnel and taken up an FIR against the police personnel and the Assam Rifles troops involved in the death of one Abdul Gaffar. Replying to a calling attention motion by MLA Joykishan, the Chief Minister said that state government had also urged the union home ministry to hand over the Assam Rifles personnel to Manipur police. While appreciating the state government for assurance to provide a government job to the next kin besides ex-gratia to every victims of custodial death MLA Joykishan ask the Chief Minister if such could be a precedent of the House for every such incident. MLA Joykishan was asking the matter while moving his call attention motion regarding yesterday’s incident at Lilong which sparked out of the death of an auto driver after he was arrested by a combined team of Thoubal District Police Commando and the 26 Assam Rifle. In his call attention motion Joykishan also draw the attention of the Chief minister on why actions are not proceeded against the AR personnel as who had equally committed the crime. Replying the motion Chief Minister N. Biren Singh said that the FIR taken up was as per report of the wife of the deceased MD Abdul Gaffar and definitely it was against the involved police personnel and the ARs. “We have suspended 5 police personnel in connection with the incident and also set up a magisterial enquiry committee”, said N. Biren Singh adding that while doing so it does not mean that we are favouring such victims without doing proper investigation. “The 5 police personnel were suspended to initiate investigation over the death and that he died in custody and custodial death is a crime”, Biren said. In a letter to the IJU, AMWJU had urged the parent body not to issue press statement regarding Kishorchandra. The letter address to the IJU President, Vice President and Secy General is being produced here. “I write this representing the All Manipur Working Journalists’ Union (AMWJU), Imphal as its President and as an Editor who has been in this profession for over 27 years that the issue of one Kishorechandra of Manipur having been incarcerated under the NSA is a non-issue at all in our State. “Nobody wants to waste time talking about it, leave alone lifting a finger for him—except a few people of his like who always play patriots, rights activists, revolutionaries and warriors of freedom only in the social media but never bother to join a movement either in the street or on the public ground launched for any cause. There are a number of human rights defenders’ bodies, Civil Society Organisations, especially women’s organisations popularly known as Meira Paibi Lups, whose sensibility toward any incident of human rights violation need not mention any further, and so many writers, thinkers and intellects in our State who can’t remain silent and snug but just jump out of their complacency to shout and demand for justice whenever an incident of gross injustice takes place. Besides there are armed rebel forces who don’t remain as silent spectators whenever there happens an incident of human rights violation in Manipur. All these organisations, proscribed rebel outfits and the intelligentsia of the State have not deemed it fit and necessary to raise their voice in relation to the arrest and subsequent detention of Kishorechandra under NSA. Because everyone knows that rule of law should prevail in the land and what he did was not a bit acceptable in a decent and democratic society, particularly in a society like ours where maintaining discipline is considered as the utmost moral obligation for everyone born and brought up here. In our society, a young person never calls an older person by name. “On the other hand, there are many right thinking and sensible Editors who edit their respective newspapers, some of which have very large circulation and are very popular, and electronic media/private news channels, who just don’t usually keep mum on any issue worth their/public attention. They write editorials and comments on so many issues daily. All of them, except one or two self isolated from the mainstream, feel that the issue of NSA detention must be fought legally, not by creating a media hype, which some of the media outside Manipur seem to be interested in doing presently. “The Editors have a body exclusively for the Editors, namely Editors’ Guild, Manipur (EGM), affiliated to the Editors’ Guild, India. The State Guild extends its full solidarity to the stated taken by AMWJU. The EGM knows very well what Kishorechandra did was to the total opposite of AMWJU’s principles and not a bit ethical as far as the profession is concerned. “Now coming to the point, Kishorechandra is/was not a member of AMWJU. He is/was not a journalist in the real sense. He was just a news reader and translator on the ISTV News. Working for the ISTV as a news anchor and translator was a front for his main profession of being the master of ceremony/ compare at public functions. So far, he has not written a single article or editorial or comment on his political ideology or concerns in the newspapers published in or outside the State. “I, on behalf of AMWJU, once again submit this humble prayer to the leadership of IJU not to release any statement on this matter that, I’m sure, won’t be able to make the Government of Manipur budge a bit but will only tarnish the image of media fraternity of Manipur in general and AMWJU in particular. Previously, the IJU had acted unilaterally without considering and respecting the position of AMWJU which had ruffled the sentiments of the media fraternity here. If the IJU acts similarly again, we may be compelled to review our affiliation to the IJU as member. Many journalists have started talking about it openly” the letter read. 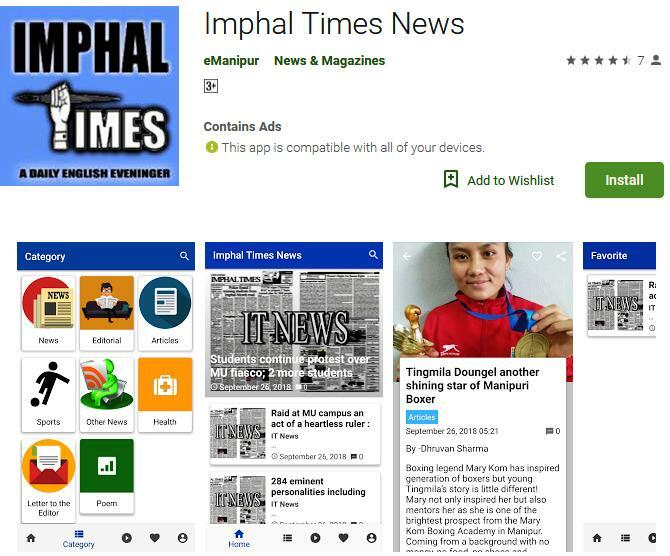 Source with the Imphal Times said that Kishorechandra Wangkhem was working as a sub editor and edited a news a day before his arrest after uploading the viral video. Bill to protect from mob violence – Will it work? Whether the passing of the Manipur Protection from Mob Violence Act 2018 by the state assembly secretariat- an appreciable a wise or appreciable one is a matter needs to be pondered. Even as the passing of the Bill is a good initiative that showed that this government takes the mob violence with extreme seriousness after witnessing series of such violence in the state, the question which is still being asked is whether the newly passed bill will be able to serve its purpose. If one looks at the Bill passed by the state assembly today under the title – The Manipur Protection from Mob Violence Act 2018, it sound that earlier the government did not have any legal measures to punish criminal if the crime was committed in the form of mob by gathering large number of people. Already there are various sections in the IPCs and CrPC , which have already incorporated the punishment for any violence if causes grievous hurt to any individuals. But none of the victim of mob violence in the state had ever got punished. It is a matter of time whether the newly passed act will be able to give justice to victims of mob mentality criminals. But if the Bill passed today lacked various sociological perspective than giving a hand to give justice to victims of mob violence with any new legislation will be like a tiger without teethes. Well, “Mob” from the sociological point of the view is a short gathering of people who got into involved in a sudden upheavals or upsurges. It probably seems to have more negative impacts rather than the positive ones. Contextualising the situation in Manipur society especially, mob justice is the dichotomy of the solidarity which instigates a sense of fear psychosis to the whole of the family members of the culprits rather than bears the heat of social justice by the culprits themselves alone. Dismantling houses, ravaging properties and destroying the belongings of the culprits are the major ways of punishing the culprits through mob justice. It is an exemplary type of repressive punishment to the culprits so that the other members in the society could learn a lesson. It warns other members of the society to forbid replicating the same act or other heinous crimes. Once a policeman remarked, “a mob has no heads, we were being taught like that in our training.” The intrinsic meaning being very clear, people in a mob are irrational. This perspective may probably be the immediate cause for the time and again act of brutality of the state forces over the people who got involved in mobs or other types of sudden upsurges. Whenever there are social collectives or solidarity in movements, they might have interpreted it from the mob angle and so usually discharged with aggressive acts to subdue them. The traditional methods employed in controlling are arresting the trouble makers, using tear gas, lathi charge, deploying more military personnel creating an atmosphere of militarization etc. In a turbulent society like Manipur, sudden upheavals becomes very common and so mob control mechanisms also needed to become more strategic rather chaotic or inhuman. Traditional societies are governed by strict social mores and sanctions. Customary laws provide ways of sanctioning against the anti-social acts. They stigmatised the culprits as an exemplary phenomena. Traditional ways of punishing culprits may be far from legal approval. And at some point of time such customary laws overreact and turn out to be destructive and disapproving. ‘Mob Justice’ is a prominent traditional way of settling crimes and a violent way of punishing offenders. It justifies an anti-social act through another heinous act. It implies approval of the Hamurabi’s code “an eye for an eye, a tooth for a tooth.” Criminals are punished through another criminal act. Mob justice doesn’t take into account the innocent dear and near ones of the accused. The dire consequence of the crime committed is made to bear by the whole family members of the culprit including the aged, women and children. When houses and belongings are burnt, dismantled, ravaged, ex-communicated or made to banished from the society, the fear psychosis that gripped the rest of the family member’s minds and has an intense negative impact. Children, in particular are traumatised. In the sole attempt to stabilise a criminal act, the whole family members, except for the culprit, again become victims of the trauma. The fear psychosis inflicted by such irrational act is really criminalising. Thus mob violence is rather a victimising act rather than sympathetic towards the victims. Thus, it remains a fact that mob violence is a crime which goes out of control many times besides having Laws for punishment which means it is a mass understanding which is required and not a hard punishment which will help preventing the mob violence. The UmanglaiHaraoba (in short, Laiharaoba), a ritual festival or the performance of ceremonial rites to appease the Umanglai (sylvan deity), is counted as the unique contribution of Meitei to the domain of world culture. The Meitei peoples in Assam, Tripura, Nagaland, Bangladesh and Myanmar also, celebrate Umanglai Haraoba. The worlds famous Manipuri dance (Ras Lila), polo and Meitei PungEshei Pala (also known as Nat Sankritan which is recognized by UNESCO), etc. are the products of Umanglai culture. The ritual festival is the greatest single key to the religion, culture and history of Meitei people of Manipur. Lai Haraoba itself is a university preserving and imparting knowledge on a variety of subjects. In short, Umanglai Haraoba is the biggest original source of all the cultures and traditions of the indigenous people i.e., the Universe of Knowledge in the Meitei society. Identity and civilization of the Meitei are reflected in this festival. It is widely helpful in the socialization and nation making process of the Meitei. It embodies the elements of common ancestry, integrity and communal harmony among the various communities residing in Manipur. Thus, it is the greatest repository of spiritual insight and wisdom of the indigenous peoples of the region. As a matter of fact, it may be said to represent the epitome of the cultural ethos of the Meitei society, (Ratan Kumar Singh, 2001). It is a vast complex of oral literature, dance and music, ceremonial and rituals, which represent a unique pre-Hindu world-view which has remained in its aesthetic sensitivity and reveals the heart of Meitei culture, (Parrat, and Parrat, 1997). Laiharaoba is an ancient Meitei fertility rite celebrating cosmic union between male and female principles. In later days it is enlarged to incorporate cosmological and ideological categories of the Meitei nation, assuming an intense and complicated ritual theatre structure.This festival is still a living legend in Meitei society till the dawn of Hindu Vaishnavism. It is one of the very distinct cultures and only the one in the entire world of its kind. The only form of conservation of forest in the prehistoric and early part of recorded history of the Meitei people was the practice of worshipping local deities known as “Umanglai”, which formed the important aspect of the religious customary practice. Before discussing the Umanglai Haraoba as a Traditional Institution, let’s have an idea about the significance of theUmanglai Culture in Contemporary Manipuri Society. Among all the various ethnic groups that have settled in Manipur, the Meiteis are credited with having the greatest number of population. But inside the Meitei ethnic group there are two religions, e.g. Meitei Hinduism and Meitei Sanamahism. One follows Hindu religion and the other follows indigenous Meitei religion (Sanamahi). Even if these two religious groups profess two different religions, the unique thing is that both of them worship Sanamahi deity and Umanglai with the same rites and rituals in equal measure. The Meitei Hindus make it mandatory to preserve the South-West Corner of the house as the abode of LainingthouSanamahi which is considered as a sacrosanct area and every day they worship this Home deity with rituals which is same as what is practiced by the followers of Sanamahism in the same corner of the house and in the same manner. Moreover, the said Meitei Hindus and followers of indigenous Sanamahi religion together pay obeisance as one, to the local ancestral deities (Umanglais) with awe and reverence with much merry-making. Both the members of the two religious groups in unison give financial contributions when Umanglai Haraoba or merry-making of the sylvan deities takes place for day’s to-gather in the locality. The Meitei Hindus and the Meitei Sanamahi take keen interest in such festivals and they perform it with ecstasy. In the Umanglai Haraoba, the origin of the Meiteis, their coming and settlement on the earth, their evolution as a social group, the struggle for existence by hard labours, agricultural works and weaving for a civilized existence along with multiplication of progeny are clearly depicted through dance. To commemorate the younger generation of these things, the Lai Haraoba is performed every year in Manipur with pomp and gaiety accompanied by offerings of fruits, flowers, prayers, songs and dances down the ages. But this should be performed under certain rules and strictures. It was greatly feared that anybody who violates these rules and practices intentionally or unintentionally will suffer and receive the scourge of God. Not only this, strict rules are observed to maintain discipline in the precincts of the Umanglai. All those who are taking part in the Lai Haraoba as also the spectators are to observe this discipline. There are beliefs galore that if the participants fail to conform to the prescribed sites and rituals along with the rules and regulations governing the different aspects of the Lai Haraoba, misfortunes are sure to befall the village people. Unfortunately, the change of time and emergence of modern society has brought about undesired influence into the festival and its sanctity has been at threat. Modern people are heavily influencing in transforming the festival into an entertainment festival. This undue influence has disturbed the psychical of tradition and culture loving citizens of the society.But during the past 40/50 years it has been seen that with the march of time there has been an almost lack of enforcement of discipline in regard to such a very important aspect of the Lai Haraoba. As a result, non-conformation of the accepted rules and standards of observance of the rites and rituals in Lai Haraoba has become very common now-a-days leading to a very unhappy trend of deterioration even to the extent of creating a complete mess. There is a tendency for the disappearance of the right kind of dress, costume, folk songs, prayer, dancing style, rites, rituals and festival materials. Most of the social disciplines present earlier during the Laiharaoba precincts are crumbling. Many irresponsible fellows have appeared on the scene acting according to their whims in complete disregard of the pristine purities of the important facts of Lai Haraoba and in violation of the sacred practices of this great festival. It is very unfortunate to think that the Laiharaoba has been slowly reduced to a mere amusement piece or entertainment programme by inserting many items quite unconnected with it. The purpose of the paper is to highlight the significance of Umanglai culture in the contemporary Manipuri society. Umanglai Haraoba is a ritual and religious festival consisting of fertility rites and ancestors’ worship. It also reveals the cosmogony-theory of the creation of the Universe then the Earth; Evolution theory of the living creatures specially human being; Self-understanding and meditation plus the abode of the almighty lord; School of philosophy and thoughts of Meitei community; Publicity for the high ideals of the Meitei; Annual conference of a Meitei village; Training Centre for leadership of Meitei ; Democratic ideals of Meitei; Defence, sports and health education system of Meitei; Integration and understanding among the villages i .e, Oneness of the village; School of financial management; School of social discipline and observance thereof. ; Protection of forest and environment; School of agriculture, handloom and handicraft of Meitei; School of oral and folk literature, dance and music; school of the various culture of Amaiba, Amaibi and Pena player; and many more. Thus, Umanglai Haraoba is the oldest traditional institution consisting of the different facets culture and tradition in Meitei society. In Manipur, in the valley area, traditional institutions like the Ahalup(group of elders), Naharup (group of youth), Singlup (locality clubs), Keirup () formed the local self-government. They looked after the general administration of the village and also resolved petty disputes. The time has come to re-look, critique as well as recommend certain reforms towards a better functioning as well as understanding of these institutions. The main objective of the present paper is to find out the roles of Umanglai Haraoba as a traditional institution for local self-governance in Manipur. The socio-cultural aspects of the ritual festival regarding its Lai Thougallup (organising committee of the Lai Haraoba) and its office bearers (Phamthou- Phamnaiba- Khullakpa, Shellungba, Keirungba, Choubon, Pakhanglakpa, Ningolakpa, Singloi, Laroi, etc. ), LaigiSenkhai, Lai Potlannaba, LaiphamthouMapan (9), SageiPiba, etc. are the main issues in the paper. The administrative set-up and the organisational structure of Umanglai Haraoba are closely related with the political and administrative affairs of the Sanakonung (the Royal Palace of the Manipur). Lai Thougallup, organising committee of the Lai Haraoba, is a tradition of local administration under the supervision of the Sanakonung. Before fixing the schedule of the Lai Haraoba, the Lai Thougallup of every UmanglaiLaikon must inform to the concern authority of the Sanakonung and must get the official order of the schedule and the required Amaiba, Pena Asheiba, and Amaibi for the festival. There is also a tradition of exempting official duties of the Phamthou- Phamnaibaof the Sanakonung during the Lai Haraoba festival of their village. The office bearers of the Lai Thougallupare selected under the supervision of the Sanakonung. LaigiSenkhai, collection of money or other required materials for the Lai Haraoba form each and every family of the locality, is a tradition of shinglup(locality clubs) consisting of the concepts of Annual conference of a Meitei village; Training Centre for leadership of Meitei; Democratic ideals of Meitei; Integration and understanding among the villages i .e, Oneness of the village; School of financial management, etc. Lai Potlannabais also a part of village administrative set up. It is an exchange of gifts during the Lai Haraoba festival among the villages and ethnic communities for integration and understanding among us. KangleiPibarel (the King of Manipur) is head of the SageiPibas(administrative head of a clan/sagei). This tradition of the SageiPiba is still preserved in the Umanglai culture. The tradition of the LaiphamthouMapan, Nine important Umanglais, is also an administrative set up for the Royal Palace introduce by NongdaLairenPakhangba and his queen Laisana. Indigenous sports meets are also organized as a part of Lai Haraoba by AhalupandNaharupPana, mobilised by the Pakhanglakpa and Ningolakpa. An institution should be formed under an Act like the Manipur State Umang Lai and Sanamahi Council Act (a proposed Act) to restore Lai Haraoba in its true and original form and also to keep on record the roots, stories and accompanying religious practices of this indigenous people. As a safe-guard against these blows on the pristine purity of Lai Haraoba, the institution should try its level best to protect, preserve and propagate this valuable gift of our forefathers in its original form by taking up various action programmes. This institution would be the only one of its kind in Manipur which is working very hard for the survival of this great festival in its true self by maintaining the social codes during the religious functions around the Umanglai precincts. The institution should also firmly believe that if the correct rites, rituals and devotional services as also the social discipline associated with Lai Haraoba are strictly observed and the merry-making of the sylvan deities are rightly performed, then our society will be peaceful, prosperous and progressive. Only then the traditional institution of Lai Haraoba for local self-governance in Manipur can be preserved. (This article was presented by Dr.Thounaojam Ruhichand Assistant Professor Department of Umanglai Haraoba, Manipur University of Culture). PMKVY (Pradhan Mantri Kaushal Vikas Yojana) comes under the scheme of “Skill India” which was launched by Hon’ble Prime Minister Shri Narendra Modi on 15th July 2015. It is a flagship scheme of the Government of India implemented through National Skill Development Corporation (NSDC) under the Ministry of Skill Development & Entrepreneurship (MSDE). This scheme aims to provide aptitude to the Indian youth towards major skills and raise the standard of working and the efficiency to complete the job. Training is imparted in accordance with National Skills Qualification Framework (NSQF) with strict monitoring guidelines enforced by NSDC.Under PMKVY, special focus is given to RPL (Recognition of Prior Learning) by recognizing prior competencies of the assessed candidates and provides a certificate and monetary reward on successful completion of assessments. RPL is an important step towards getting formal acceptance and respect for informally acquired knowledge and skills. Recognition brings respect, increases productivity, creates options for growth through RPL. Chanu Creations, Imphal, Manipur has been trained RPL training to 150 weavers in North Sikkim District on the job role ‘‘Two Shaft Handloom Weaver’’ under Ministry of Skill Development & Entrepreneurship (MSDE) through National Skill Development Corporation (NSDC) as Project Implementing Agency (PIA). It shows the trainees a path to bridge their current knowledge and skill levels to reach a competency level or go for higher skills for professional growth. Today the 20th December 2018, the certificate distribution ceremony for the certified RPL trainees of North Sikkim District was held in Tingvong, North Sikkim. The event was attended by Passang Doma Lepcha Ex-Panchayat Dzong North Sikkim District, Smt. Chirom Indira (National Awardee 2015, Nari Shakti Puraskar Awardee 2017, DMA All India Women Entrepreneur Awardee 2017 & Vasundhara Hall of Fame Awardee 2018, Women Transforming India Awardee 2018) Proprietor/CEO Chanu Creations, Onkit Lepcha Social worker, Shri W. Joyshankar Luwang, Project Manager Chanu Creations, Shri Prakash Rai and Jorden Lepcha (Social Workers) were grace the function as Chief Guest, President and Guest of Honours respectively. Manipur Scheduled Tribe students were today denied entry in the college they are studying for nearly last 3 years now. The college management shut the main doors of the college and did not allow the tribal students belonging to Manipur to appear in the exams. These students took admission, under Post Matric Scholarship (PMS) scheme funded by central Govt. of India, during 2014-15, 2015-16, 2016-17 and 2017-18 are pursuing various graduate and postgraduate level courses in the Vidya Jyoti College in the state of Punjab. As per the students the Department of Tribal Hills & Affairs, Govt. of Manipur, Imphal released nearly the full scholarship amount to the students who applied in the year 2014-15 but later on release 20% of the fees sitting the reason of Fee Fixation. Mr. CT Thotshem, President of Manipuri Students Union, said that there are more than 100 students from Manipur studying in this college whose future is now at stake due to the non-payment of scholarship fees by the state government. He said that earlier the college gave us several notices to submit the college fees but now they want us to clear the dues else we won’t be allowed to appear in the exams. Mr. Thotshem added that our union and the college management has sent several request letters and reminders to the Director of Department of Tribal Hills & Affairs, Govt. of Manipur but nothing has been done so far. We even approached the National Commission for Scheduled Tribes in Delhi in the month of October and submitted a student representation but haven’t got any response from the Director so far. The central government has started these kinds of schemes for the upliftment of the tribal students who want to avail higher education at recognized institutions within India but these tribal students from Manipur are struggling to get what they are entitled to. This is a very crucial time for the students as the exams are going on but instead of shaping up their future they are busy drafting letters and knocking government doors with a hope to get their scholarships and subsequently an entry to the examination hall. Students are now approaching the Chief Minster for help otherwise they are left with no other option to take extreme step with their lives.